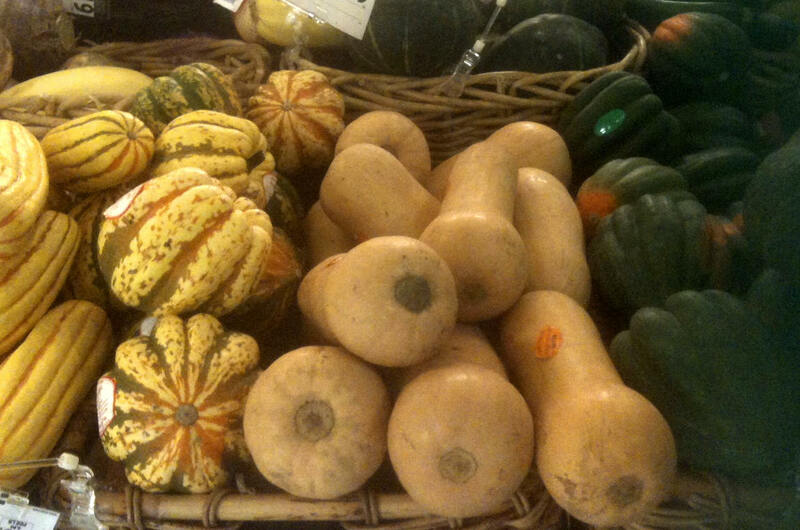 I always know that summer is over when I walk into my grocery store and see the abundance of winter squash varieties. Butternut squash, with it’s lovely orange-colored flesh and sweet flavor, has always been a favorite of mine. Not only is this pear-shaped squash delicious and versatile, but it happens to be really good for you too. Butternut squash is low in calories and packed with nutrients. One cup of cubed squash only has 82 calories and no fat or cholesterol. It’s a rich source of fiber which besides promoting good GI health also helps lower blood cholesterol levels and control blood sugar. It also keeps you feeling fuller longer which makes it a great food for weight loss programs. Butternut squash is high in several nutrients such as Vitamins A, B-complex and C as well as potassium and magnesium to name a few. The rich orange color means it’s packed in beta carotene which gets converted to Vitamin A in the body. One cup of cubed squash has 457% of the recommended daily allowance! Vitamin A is important for vision, immune health, growth and reproduction. Butternut squash is very versatile- it can be used in sweet or savory dishes. It’s most commonly steamed or roasted but can also be added to stir fries and stews or pureed and incorporated into risotto, pasta or everyone’s favorite- butternut squash soup. Even the seeds are edible and when roasted, they make a nutritious snack. 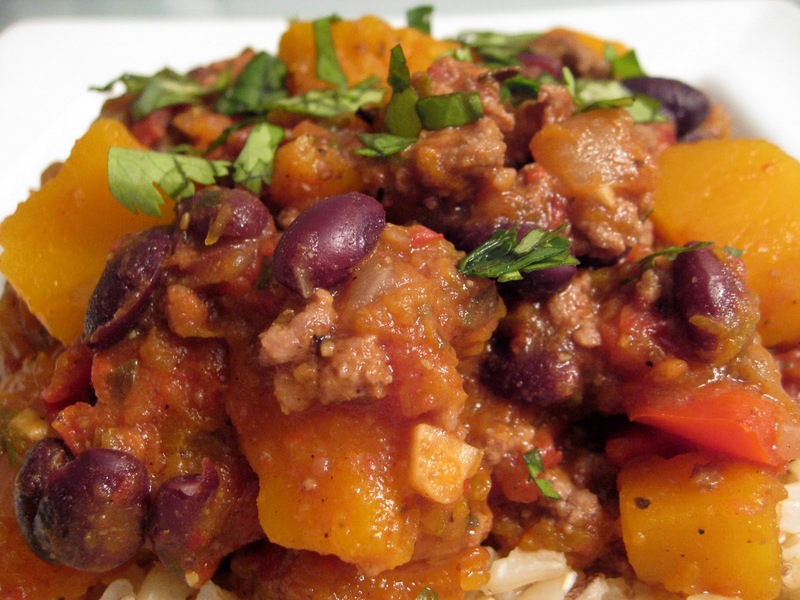 Try this hearty and nutritious chili recipe that’s perfect for fall. The sweet butternut squash works well with the smoky heat of the chipotle chilis. 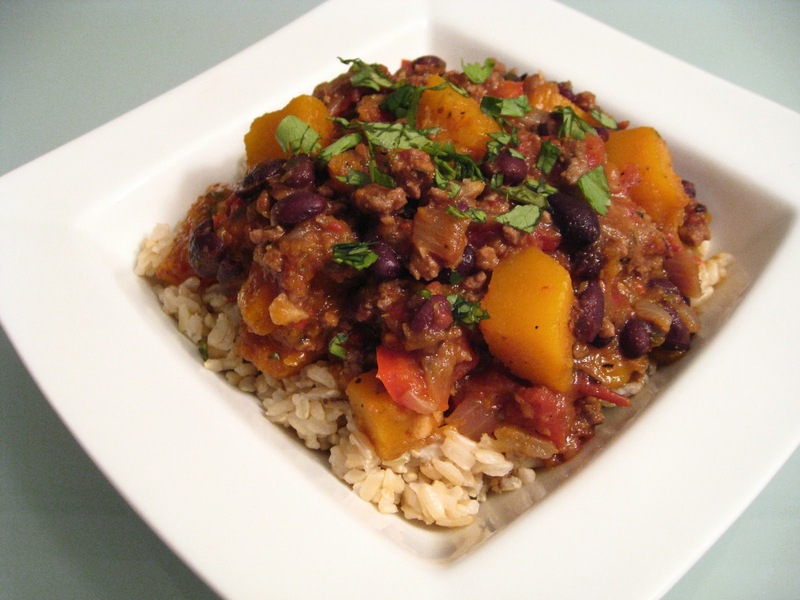 By incorporating healthy vegetables and black beans in this dish, only a small amount of ground beef (1/2 pound for 6 servings) is added. This cuts down on the calories and fat and no one will even miss it! This dish can easily be made vegetarian by omitting the ground beef and adding an extra can of beans. « Reading with the Doc: The Food52 Cookbook is Here! Hey Sonali! I didn't know you had a blog! This recipe looks nice. I think I'll give it a shot without the beef. Hope all is well! Thanks Sam! I didn't know you had a blog either (and I also didn't know that you're a male Buddhist monk) 🙂 Let me know how it goes if you try the recipe! we love butternut squash. you have given us a new way to cook it. I can't wait to try it, minus the meat. I made this the other night and it came out great! I substituted finely chopped carrots for the red peppers. The sweetness of the squash went really well with the smoky spice of the chipotle peppers. I will definitely be making this again! Thanks, Leika and ur! The carrots sound like a great substitution for the bell pepper- they have a natural sweetness so I think they would taste really good with the smoky chipotles. Happy Holidays! I made this the other night and both my husband and i loved it! it's nice and hearty for a cold night out and there were plenty to go around for leftovers to bring to work! i made it with some quinoa and added some brown sugar and some more heat to make it spicier (We've got spicy palates!). Great recipe! THANKS!!! keep the vegetarian recipes coming!